♦ Bókadómur: The Guardian birti á dögunum samantekt af bókadómum úr sunnudagsblaðinu The Observer, hvar Sagan af bláa hnettinum eftir Andra Snæ Magnason fær góðan dóm hjá Kitty Empire. Með fylgdi myndlýsing úr bókinni, sjá hér til hliðar. Tengill á netútgáfuThe Guardian: Kitty Empire: Fiction for older children reviews – delight in wordplay, disrespect for authority and a touch of evil. Birt 26. júlí 2015. 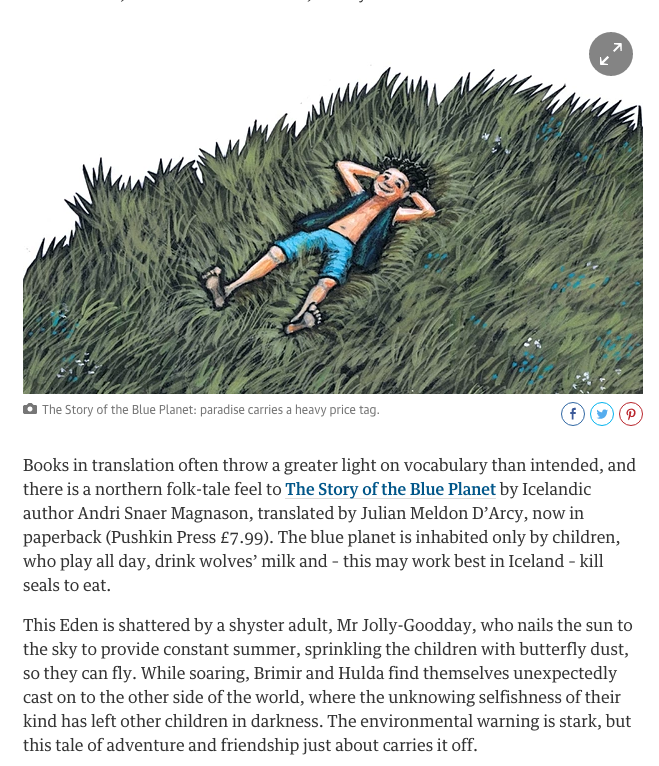 ♦ Book review: The Guardian published a children’s book reviews round-up from The Observer where The Story of the Blue Planet by Andri Snær Magnason receives a nice review by Kitty Empire. See here on the left. Illustration by yours truly! Link to the article in The Guardian online: Kitty Empire: Fiction for older children reviews – delight in wordplay, disrespect for authority and a touch of evil. Published 26 July 2015. This entry was posted in bókadómur | book review, myndlýsingar | illustration and tagged Andri Snær Magnason, Áslaug Jónsdóttir, Pushkin Press, Sagan af bláa hnettinum, The Story of the Blue Planet. Bookmark the permalink. ← Skrímslafréttir | Monster news!